The emergence of collective strategies in a prey-predator system is studied. We use the term “collective” in the sense of the collective motion of defense or attack often found in behaviors of animal grotips. In our prey-predator system, both prey and predators move around on a two-dimensional plane, interacting by playing a game; predators can score by touching the backside of a prey. Thresholds are assumed for the scores of both prey and predators. The species with the higher scores can reproduce more, and that with the lower scores will be diminished. 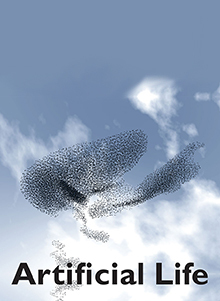 As a result, strategies as collective motions are observed; these consist of rotating cluster motions, line formations, disordered but one-way marching, and random swarming. In particular, the strategy of random swarming encourages symbiosis in the sense that it is associated with a low extinction probability for the whole system.